With a Classic Swell Shoe kit (SSM-001), a Classic MIDI pedalboard can be equipped with expression pedals and a crescendo pedal that look and feel just like those on a good pipe-organ console. A rack-and-pinion gear drives a potentiometer (variable resistor) that is connected to the Classic MIDI Keyboard or the MKSC-4A MIDI keyscan computer located inside the Classic MIDI pedalboard. Operating the shoe causes voltage changes which the MKSC-4A detects and converts to corresponding MIDI volume-controller messages. Engineered to the exacting specifications of the American Guild of Organists. 1 3/4" bracket for mounting inside a traditional console. Connects to the Classic MIDI Keyboard, Pedalboard switch kit or the Classic MIDI Pedalboard to produce MIDI messages. Beautiful wood finished in red walnut. Rack and gear to drive a rotary potentiometer. Requires no external power. Power is derived from the Classic MIDI Keyboard or MKSC 4a Pedalboard scanner board. Unlike typical MIDI volume pedals, the Classic Swell Shoe is like swell shoes found on church organs. As such, it is ideal for home or practice use. When connected to the Classic MIDI Keyboard or the MKSC-4A controller in a Pedalboard, the swell shoe can be used to adjust volume levels on MIDI sound modules conforming to the MIDI standards of the MIDI Manufacturers Association. This includes MIDI sound modules from Ahlborn Galanti and PC-based synthesizer software such as Hauptwerk. With the addition of MIDI keyboards (ideally the Classic MIDI Keyboards), a low-cost, high-quality home organ console can be constructed with most of the features of more expensive pipe and electronic organs. This swell-shoe is designed for newer Classic MIDI pedalboards equipped with the MKSC-4a keyscan computer. If you purchased a Classic MIDI pedalboard before June 1, 2004 and would like to attach our swell-shoe, please contact us for further details. 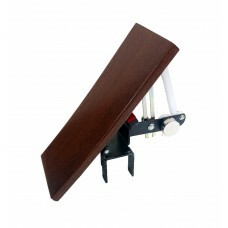 There is no clamp for a MIDIWorks pedalboard in this swell-shoe kit. This shoe is for mounting inside a console on a regular 1 3/4" thick mounting rail. Our MIDIWorks MIDI pedalboard can connect a maximum of 3 swell shoes.